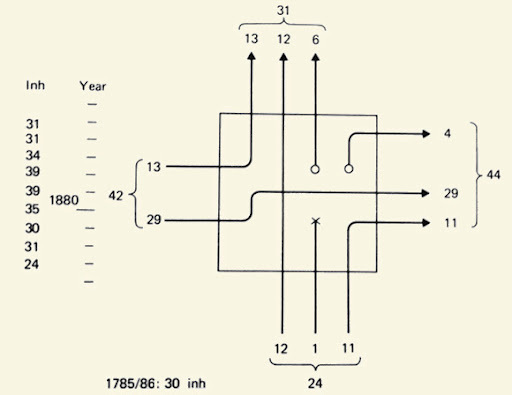 The famous time-space diagram by Thorsten Haegerstrand has featured a number of times on the blog. It was used often for a rather short time span. Initially Hagerstrand was more interested in long term time-space spans, such as life time patterns. In his Survival and Arena he describes an earlier version of the time-space diagram based on his research on life-history in relation to their geographical environment. One of his examples data describes the population associated with a farm for over 100 years. The data spans from 1840 to 1945. This setup is still clearly a setting focusing on the geographic location. The farm stands in the centre of the observation and the population fluctuates. Image by urbanTick / Taken from Hagerstrand, Survival and Arena in Timing Space, Spacing Time by Carlstein 1978. / The population associated with a farm between 1840 and 1945. Categories A-owner, B-tenants, C-lodgers, D-farmhands and maids. There are other studies that look at tracks beyond the life of the individual. Another famous example is the study by Bradley, where he traced the life-time tracks of four generations. Here the representation rests on the map and does not explore aspects of time. 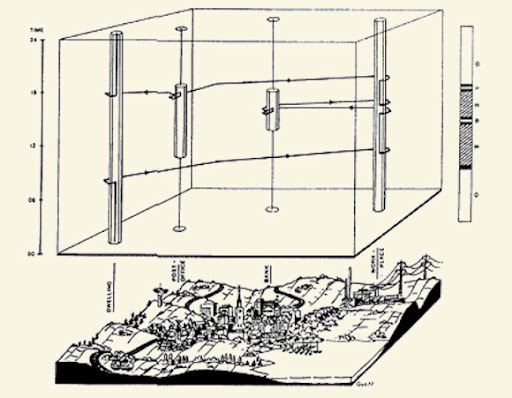 However Hagerstrand started incorporating the time aspect and the initial visualisation diagram was simply 2D and really complicated Only later the nowadays famous time-space aquarium was developed. Image by urbanTick / Taken from Hagerstrand, Survival and Arena in Timing Space, Spacing Time by Carlstein 1978. / Representing the farm in space and time. Vertical lines represent the occupiers and horizontal movement represents the newcomers and leavers. Only later this space-time representation was developed in to the aquarium type of visualisation. It is widely quoted and very famous, but reminds remarkably abstract and iconic. It raised a lot of critique and it can be said, that it remained largely theoretical and abstract model. This is due to the lack of computing power to actually process the available data and render the visualisation, but even nowadays, were it is possible as demonstrated for example by Kwan or Miller it remains unused. Some time-space aquarium examples on the urbanTick blog. One of the problem is the complexity the representation gains as soon as it cover longer timespans or numerous individuals. It reaches the limitation of a 3D visualisation displayed in 2D. 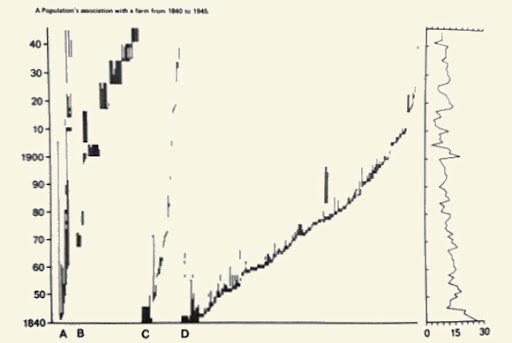 Image by urbanTick / Taken from Lentrop, A Time-Geographic Simulation Model of Individual Activity Programmes, in Timing Space, Spacing Time by Carlstein 1978.